The most rumored smartphone from ONEPLUS, OnePlus 7 and 7 pro has surfaced online just before it’s formal launch. OnePlus 7 sport a waterdrop-style notch, and OnePlus 7 Pro will sport a Popup selfie camera setup. Accoring to rumored renders, The OnePlus 7 will feature dual rear camera setup and OnePlus 7 Pro will feature a triple rear camera setup. It is expected that OnePlus can launch their new smartphone OnePlus 7 and & 7 Pro on May 14. 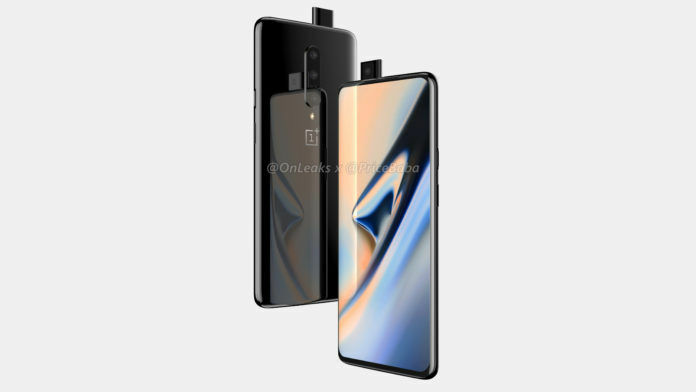 Courtesy OnLeaks and PriceBaba leaks suggests us that the design of OnePlus 7 could be similar to OnePlus 6T. if talk about OnePlus 7 Pro than it’s design can be different from OnePlus 7, as OnePlus 7 doesn’t has any notch at screen, instead of a notch it will have a popup selfie camera setup and OnePlus 7 leaked images shows us that it features a waterdrop-style notch at the top of screen. The ports and button placement on the smartphone OnePlus 7 are also identical to OnePlus 6T, there is an alert slider along with a power button on the right, while at left side has a sim tray and volume buttons. At the bottom it’s appear that it will have a USB Type-C port. It is also claimed that the smartphone OnePlus 7 will have 157.7×74.8×8.1mm in dimensions and will 9.5mm of thickness. If we talk about OnePlus 7 Pro, than it will have a new design and sports a popup selfie camera setup and triple rear camera setup. According to surrounded rumors, the OnePlus 7 Pro will have a dual-edge display panel. Also Read: Top five smartphone under 10,000 inr. According to the renders surrounded, the tipster @OnLeaks Twitter account, has leaked the key specs of the OnePlus 7 and 7 Pro. The OnePlus 7 is claimed to sport a 6.4 inch flat display along with a waterdrop-style display notch and claimed that it will have dual rear camera setup with 48MP primary sensor. It is said that OnePlus 7 Pro will sport a 6.64 inch curved display with Popup front camera setup with triple rear camera setup with 48MP primary sensor. It is also claimed that rear camera setup include with telephoto and ultra-wide angle lenses.